The question as to whether Angels exist has been the subject of controversy since the dawn of mankind. Certainly, the Bible tells us that they exist, and for many, that's all the proof needed. But how can the skeptics among us be convinced that they actually exist? Is there any concrete evidence? Obviously, a belief in one, all-powerful God is a prerequisite to believing in Angels. Through history, Angels have been assigned many duties, including heralding the birth of Christ, spreading the Word of God, serving as God's messengers, exacting punishment in the name of God, and protecting people or nations from evil. Many believe that as very young children, we were all in contact with our personal Angels - long before our parents made us aware that such a concept even existed. Another common belief is that deceased relatives and friends may be watching over us in Angel-like fashion, ready to assist when things get rough for us. The idea of Angels being there to protect us is a very comforting one, but, again, is there any actual basis for believing this? Reports of Angel encounters from vastly different cultures and lifestyles tend to be remarkably similar. Many cases of "miraculous cures" have been attributed to visitations by Angels, along with many situations in which the attitudes of the person suddenly change drastically, though the basic life situation remains the same. The Christmas story of Scrooge is a wonderful example of this type of Angelic intervention. Unfortunately, Angels do not make themselves known to everyone, nor do they always reveal themselves when specifically called. The proof of their existence is therefore a very personal thing that is closely intertwined with the fundamental religious beliefs of each individual. The conviction that Angles exist appears to happen little by little - in dreams, in the wonderment of nature, in sudden realizations and deja vu, in intuitions, and even as happenstance coincidences. So basically, no, there is no concrete proof that Angels do exist, though millions have experienced this phenomena and have unshakable belief. For those with no God and no spiritual beliefs, trying to convince them of the existence of Angels is not possible. For the rest of us, all we need to do is open up spiritually and the answer will very likely come to us at an unexpected moment, maybe even in a dream. 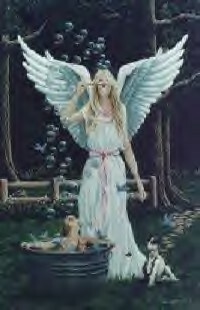 This section is devoted to examining Angel phenomenon in general along with various theories regarding their existence, exploring the various types of Angels and what their actual purpose might be, and publishing true stories related by people whose lives have been changed by the realization that they have been assisted by an Angel. If you have a personal story you would like to share, please feel free to post to the Message Board below, or privately E-Mail us. We are very interested in your stories, and will respond immediately. As always, be sure to Bookmark this page, as we add new material on a daily basis, and come back often!